I only read four graphic novels and manga this time. I had more planned originally, but other commitments and some unforeseen circumstances meant that I didn’t have as much reading time as originally planned. Such is life I suppose. Full reviews will be posted of each book, but below you can find what I read and some thoughts on each volume. This is the second volume in a series about a woman named Lu, who isn’t quite human. This is a high fantasy adventure series that is a TON of fun, and most definitely my favorite ongoing graphic novel. Volume 2 concludes the story line from the first volume, introduces some new characters, and tells a lot of Lu’s history. 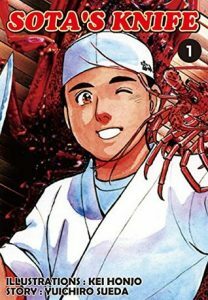 This is the story of Sota, a young man whose a dishwasher in an upscale resturant who aspires to become a head chef himself one day. A slice of life story about following your dreams, hard work, and food. It was a fun story with a very likable protagonist. I’ll definitely be reading more in this series. I love Lumberjanes. It’s a great series and I really need to catch up on all of these. This volume was fantastic. 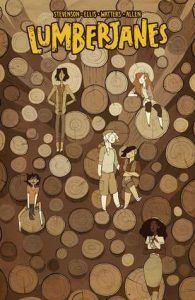 We learn a bit more about the Lumberjanes as an organization as well as the camps leader. A few questions are answered and many more are opened. This is probably my favorite volume since volume 1. 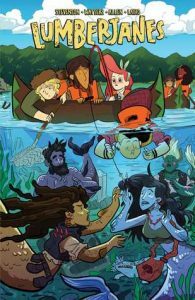 I continued on my Lumberjanes reading spree with Volume 5. This was a fun side adventure that focused more on characterization and character development than the overarching plot. The girls get involved with a kerfuffle with some merpeople living in a nearby lake with chaos quickly ensuing. While I liked the art style in this volume I did find it difficult to ID a few of the main characters when I first saw them. This was definitely not a deal breaker, but is something to keep in mind. Full reviews will be posted on each graphic novel and manga over the next few weeks. As always, I had a lot of fun with the #GetGraphic readathon. It was a great way to get back into reading after being in a bit of slump the past couple of weeks. I can’t wait to read more of the Lumberjanes series. 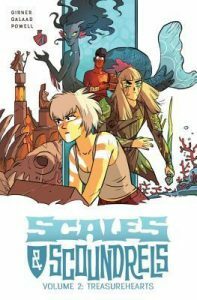 I can’t wait for more Scales & Scoundrels. And I can’t wait for the next #GetGraphic readathon. Did you participate in the readathon? What’s the last graphic novel or manga you read? Let us know!